Neutrinos are in the news again, this time due to a recent paper in Science from the IceCube Neutrino Observatory. One of the goals of the observatory is to pinpoint the source of very high energy neutrinos, and this latest paper presents some initial results. One of the challenges with neutrino observatories is that neutrinos don’t interact strongly with other things. This means neutrino observatories have to be large and sensitive. In the case of IceCube, it has thousands of detectors distributed over a cubic kilometer, all more than a kilometer beneath the antarctic surface. The detectors don’t observe neutrinos directly, but instead detect small flashes of light that occur when neutrinos collide with water molecules. The collisions create electrons (or muons or tauons) which then create the flashes of light. Another challenge is that it is very difficult to shield your detector from stray neutrinos. Neutrinos are continually produced by the Sun due to nuclear fusion in its core, and bursts of neutrinos are formed when cosmic rays strike our atmosphere. This means a neutrino observatory is bombarded with neutrinos from the Sun and our atmosphere, which makes it difficult to distinguish interstellar neutrinos. Before IceCube, the only confirmed interstellar neutrinos were from supernova 1987a. To distinguish extrasolar neutrinos from local ones, the project team looked at two things: directionality and energy. Most neutrinos come from the Sun, but they also come from the direction of the Sun. The neutrinos from cosmic rays are a bit more tricky, but they have a somewhat different signature than is expected from interstellar neutrinos. When the data was analyzed, there were 28 neutrino events that appear to be of interstellar origin. They are plotted in the figure below (taken from the paper), along with a color representation of their energy. You might notice a clustering of events in the lower left region of the map. That region is roughly where the center of our galaxy is. Galactic center is an area where we would expect high energy neutrinos, so this hints at an observation of neutrino physics happening at the center of our galaxy. But as the authors point out, we should be a little cautious. This is an observation of only 28 events. 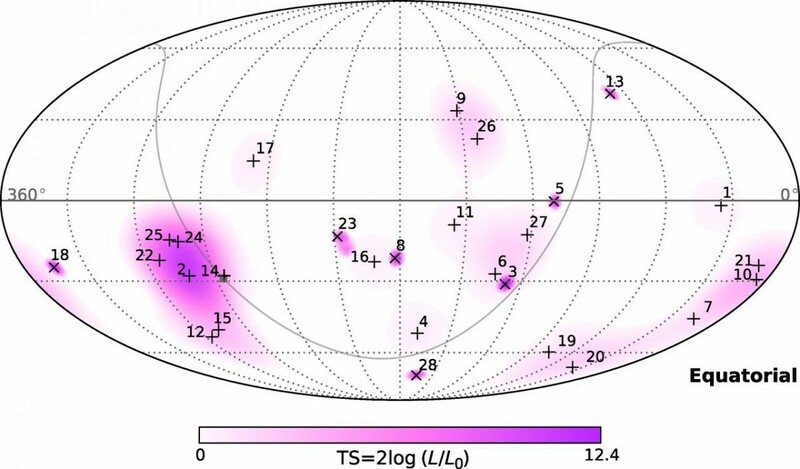 A random clustering of a few of them would not be unusual, and the fact that they are in the general region of galactic center could just be due to chance. We’ll need more observations to determine whether this is a real signal. But this looks really promising. We have finally detected interstellar neutrinos, and the results are broadly what we expect. So now we have another tool with which to study the universe.